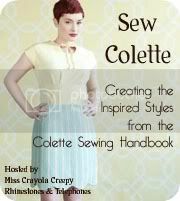 What better way to start this years sewing with a sew-along! I got the Colette Sewing Handbook during the holidays and reading it has inspired me to better document my projects, both sewing and knitting. So finding the Sew Colette sew-along on Rhinestones and Telephones made me decide to actually sew the five garments in the book and document them here. There are a few designs that I hesitant about so I’ll definitely put my own twist to the patterns. First up is the Meringue Skirt! I want to add a waistband since I haven’t really like skirts without waistbands in the past. This should be as simple as just adding a waistband to the skirt since I also want it to sit on my natural waist. Lengthen the skirt. I’m not really comfortable with skirt-lenghts above the knee so it needs to be lenghten what looks like several inches. The sew-along continues on January 12 with measurements and sewing the muslin. Time to pick up the pattern and start to prepare!